The same as for the in Two Land and Three Land. Import (add) in Two Land and Three Land with the Fair Lands blocks. Do so in Ten Land and at least one other land with counters. If Ten Land blocks are available, do so with them before doing so with counters. 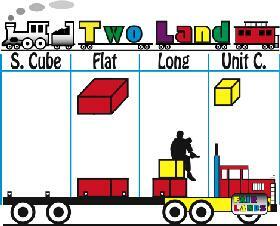 Once students can “think blocks” and add in Two Land and Three Land, they can add in any land. All that changes in adding in different lands or bases is the number of blocks the same that make the next bigger block. Tiger wins again because he cleared his board before Lion. 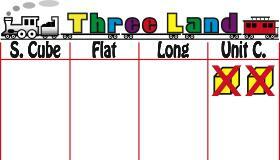 After the two penny games, elementary school students need to learn how to represent Two Land and Three Land numerals on a Fair Lands activity board with the Fair Lands blocks. 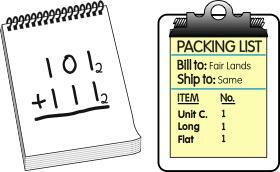 This is taught by having them place the blocks on a board in response to “show me” directives for numerals like 1,0102 and 1,100,1012 for Two Land and 1,2023 and 2,001,0213 for Three Land. (The subscripts tell the land.) Then do the reverse: have them write the numerals for blocks already on a board. About the subscripts, it’s important that children become accustomed to them because of the huge use that’s made of them in higher math. They may look scary and super abstract, but they’re no big deal to children, even young ones. They’re nothing but tags. They simply tell what land the numbers are in. Numbers without subscripts are assumed to be in Ten Land. The sequencing for both operations is the same: importing or exporting with Stage 1 or Stage 2 recording. Stage 1 recording means just write the answer. Stage 2 recording means “show your work”: record each trade that was made to get the answer. It is Tiger’s turn again and he tosses a head, so he takes two Unit Cubes off his board.